POLICE WATCH INDIA (Regd. NGO). This is to bring to your Notice the most Bitter Truth that everybody, EXCEPT THE POLICE FORCE, is not only keeping abreast with the changing times but firmly believe that CHANGE IS THE ESSENCE FOR HUMANITY TO KEEP SURVIVING. 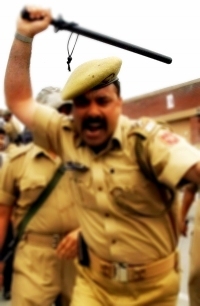 The Notorious Reputation of Errant & Corrupt Police Personnel/Officers being Barbaric holds good even today as it is not necessary that to be Barbaric one has to resort to Physical Barbarism. The worst kind of Barbarism is one which is perpetrated on the Emotional and Mental Plane by the Police Force in India on the Hapless Aggrieved, who as it is are Victims of Circumstances. Custodial Deaths have not ceased to exist. Even today Genuine Victims of Crime i.e. the Aggrieved Complainants are denied their Rights, by Errant and Corrupt Cops, to get F.I.R.s Registered, to get/obtain a copy of the F.I.R., to get a copy of their Statements got Recorded by Police Officers which as a matter of Routine are Recorded by Police Officers in their own Handwriting and in many cases gaps, in the Statements thus Recorded, are deliberately left by the Police Officers for misuse at a later date etc. All Police Officers i.e. without exception deny the Complainant any information as regards the progress made by the Police in ensuring deliverance of justice to the Complainant. The standard replies of the all Police Officers are, AN ENQUIRY REPORT HAS BEEN SENT TO THE SENIORS FOR DECISION. When the Aggrieved Complainant goes to meet the Senior Police Officers the reply he gets is either the same he/she has got earlier or NOTHING IS PENDING WITH ME and nothing beyond that. This Barbaric handling of the Aggrieved goes on till the file containing the Aggrieved person’s Complaint and the choicest concoctions/notings of the Police Officers, which would put the best of the negative story writers to shame, get lost into Oblivion along with the Hapless Complainant. IT WILL NOT BE OUT OF CONTEXT TO STATE THE MUCH KNOWN FACT THAT FIRS ARE REGISTERED AT THE DROP OF A HAT IF THE AGGRIEVED VICTIM OF CRIME IS WILLING TO PLEASE THE SHO/IO. It is very well known to POLICE WATCH INDIA i.e. after conducting DETAILED INVESTIGATIONS, that the Senior Police Officers who otherwise are nothing but ASTUTE SWEET TALKERS akin TO SUGAR COATED CYANIDE PILLS, not only unashamedly justify/uphold the CONCOCTIONS of their subordinates but also INHUMANLY & UNASHAMEDLY ADD THEIR OWN CONCOCTIONSto deny justice to the Aggrieved. The story is the same in THE POLICE VIGILANCE DEPARTMENTS & WITH THE POLICE VIGILANCE OFFICERS as they are birds of the same Feather, Hue and Dispensation as other Police Officers. The Complainants Should Not Be Denied The Right To See And Inspect Files Pertaining To His/Her Complaint, Vigilance Officers At No Cost Should Be Police Officers, Etc. Rampant corruption in the police force can be stemmed if the unholy police – politician — criminal nexus is exposed, policing made more effective and incidence of crime curbed if we make a beginning by implementing these and other steps forthwith. Transparency at all levels is the password to ensure fair justice to the aggrieved as well as in the interest of our future generations so that our future generations have a better world to live in, work and play and crime free. IT IS CERTAINLY POSSIBLE IF WE TAKE STEPS IN THE RIGHT DIRECTION WITH AN UNFLINCHING STUBBORN DETERMINATION TO SUCCEED.